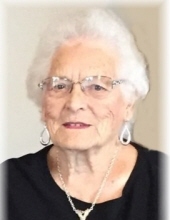 Lois Engstrand, age 90, of Braddyville, Iowa entered into peace Tuesday, March 19, 2019 at Clarinda Regional Health Center, Clarinda, Iowa. Graveside services will be held 11:00 AM Friday, March 22, 2019 at Braddyville Cemetery, Braddyville, Iowa with Scott Davison officiating. Open visitation will be held Thursday, March 21, 2019 at Ritchie Funeral Home. Interment will be held at the Braddyville Cemetery. Memorials may be directed to Braddy Hall or to the Braddyville Fire & Rescue. Memories and condolences may be shared with the family on our website at, www.ritchiefuneralhome.com under Obituaries. Arrangements were entrusted to the Ritchie Funeral Home of Clarinda, Iowa, where we ‘Celebrate Life’. Lois Wilma Engstrand was born September 17, 1928 southeast of Clarinda, Iowa to Lasure Ridnour and Grace (Davis) Ridnour. Lois grew up in the New Market area. She graduated from Glenwood High School in 1945. Lois was united in marriage July 28, 1948 at Bentonville, Arkansas to Wendell Engstrand. They were blessed with two daughters, Nancy and Donna. They lived west of Braddyville on a farm for 60 years. Lois was with the United States Postal Service for 45 years. She began her career as a clerk and she was Postmaster of Braddyville for several years. Lois enjoyed living on the farm. She was an outdoor person and enjoyed taking care of the farm work including fencing and taking care of the livestock. Playing bridge, bingo and watching the Chicago Cubs were favorite pastimes and she especially loved playing cards with the grandchildren. Preceding Lois in death are her parents; husband, Wendell Engstrand (1978); grandson, Korey Lynn Marriott; son-in-law, Dennis Henneman; in-laws, Orland and Phyllis Engstrand, Martin and Sharlene Engstrand, Ruthe and Virgil Kelley, Harley Kissinger and Robert Mann. Left to cherish her memory are her daughters, Nancy Henneman of Sidney, Iowa and Donna Marriott (Randy) of Braddyville, Iowa; grandchildren, Scott and Shannon Henneman, Kimberly and Kiley Payne, Kris Henneman, Kyle Marriott, Kolby Marriott and Trisha Conley; great grandchildren, Ashley Henneman, Dacey Henneman, Makensey Henneman, Kaden Payne, Kolt Payne, Quincy Marriott; sister, Maxine Mann; nieces; nephews and many friends. "Email Address" would like to share the life celebration of Lois Wilma Engstrand. Click on the "link" to go to share a favorite memory or leave a condolence message for the family.